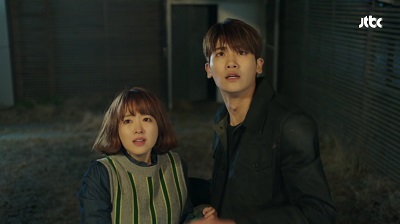 Strong Woman Bo Dong Soon is about a woman with super strength (Park Bo Young) who becomes the bodyguard to an eccentric chaebol heir (Park Hyung Shik). A love triangle develops between them and the woman’s longtime friend (Ji Soo) who is now a police detective on the hunt for a serial kidnapper. Strong Woman Do Bong Soon was a fun drama that mixed in romantic comedy along with darker crime elements. It has some issues, but with a main couple that will leave you with a cheesy grin on your face episode after episode, they are the reason to watch this drama. Park Bo Young plays our strong woman Do Bong Soon. She’s so tiny and is about as cute as can be! Park Bo Young really brings this character to life with her comedic abilities as well as being so completely endearing. Bong Soon is an easy character to root for and connect with. 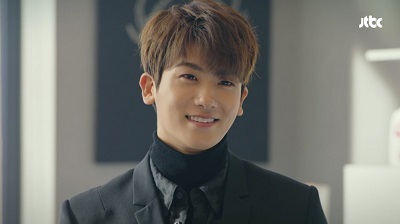 Park Hyung Shik is our eccentric chaebol heir who runs a software company. 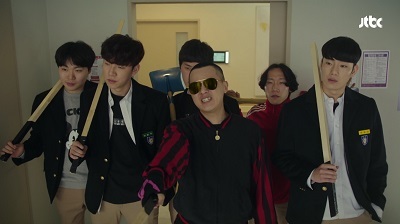 When he discovers Bong Soon’s ability, he immediately hires her as his bodyguard. Little did he know that he would fall head over heels for her. And if you like a leading man that dotes upon his lady and displays all kinds of cuteness, look no further than Park Hyung Shik! Ji Soo plays In Gook Doo. He’s a long-time friend of Bong Soon’s who she has harbored a crush on since middle school. Now a police detective, he’s on the hunt for a criminal who is abducting young women. And it’s his concern for Bong Soon’s safety that finally brings his feelings for her to the surface. 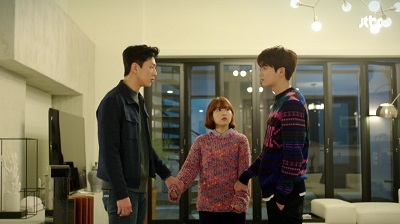 The love triangle was pretty fun in the drama. I really enjoyed both guys for different reasons. Park Hyung Shik was a lot of fun, and he had a really great rapport with Park Bo Young. On the other hand, Ji Soo is more stern and fiercely protective. Ji Soo is dramaland’s resident puppy, and I knew going in that it would be difficult watching him realize his feelings too late and end up pining for the girl yet again. Ji Soo! I can’t handle you as the second lead anymore! But of course, the main thing to get excited about with this drama is the main couple. Park Hyung Shik and Park Bo Young are about as cute as it gets. Min Hyuk falls hard for Bong Soon and boy does it show! He loves her to pieces and is very protective. And Bong Soon compliments him perfectly. If you want to see tons of adorable couple moments, look no further than these two. There’s also some fun concerning the guys. Min Hyuk and Gook Doo definitely do not get along. 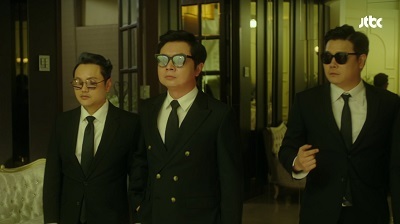 This created some particularly entertaining moments during the earlier episodes of the drama typically involving alcohol. I just wish there could have been a better developed bromance between the two. We then have the crime side of the drama which gives us a little excitement and some thrills. There are definitely some pretty dark elements involving the abducted women. The kidnapper is pretty creepy, and the women go through some quite difficult and scary things. The drama does have a few negatives though. The plot for Strong Woman Do Bong Soon was a bit all over the place. It was tonally uneven and just kind of felt like it bounced around too much. This worsened as the drama progressed. I also felt there was way too much focus on some of the side stories. There are a lot of humorous supporting characters ranging from family to high school thugs to gangsters. They are all fairly one dimensional and are mostly meant as additional comic relief. But the deeper we got into the drama, they just kept getting more and more screen time. While it was still humorous at times, it all began to feel sort of redundant and pointless. At times I found some of this stuff very draggy. It kind of felt like I was watching two separate dramas which was not really a good thing. It’s disappointing that so much time was wasted on this since there was a pretty great main story in place. There was so much more that could have been explored with Min Hyuk’s family and the trauma from his past. Gook Doo could have also been fleshed out a lot more which could have made for more tension concerning the love triangle. So many important plot points either wrapped up way to early or were just kind of abandoned. The drama as a whole could have benefited from better pacing of the story, exploring it more in depth, and being more tonally even throughout. And less of the silly gangsters! Another big negative with the drama concerns a massive logic fail surrounding the mythology of Bong Soon’s super strength. If you’ve read many of my reviews, you’ll know that I’m usually extremely forgiving of illogical happenings in a drama. They just don’t typically bother me. Despite some shortcomings, Strong Woman Do Bong Soon did end up being a very fun drama overall. Park Hyung Shik and Park Bo Young are both adorable individually as well as together. As I mentioned earlier, they are the reason to watch this drama. The main story is good, though it suffered from a lack of development and uneven pacing. There is plenty of humor as well as a few thrills to keep things exciting. So overall, Strong Woman Do Bong Soon was more than enjoyable and left me with mostly good feelings. This entry was posted in Reviews and tagged Ji Soo, kdrama, Korean Drama, Park Bo Young, Park Hyung Shik, Strong Woman Do Bong Soon. Bookmark the permalink. I definitely enjoyed it for the most part and still gave it a decent rating. This is one of those shows where the main couple is so ridiculously good and fun together that it sort of gets you though the other parts. And from other reviews I’ve read, most have been extremely positive because of this. But you definitely can’t deny there was some weak writing, inconsistencies, and a lack of focus. This is gonna be the very next drama I check out. 🙂 I’m happy to see that for the most part, it has been getting positive reviews. You definitely described exactly what I was thinking about this drama!! (I currently just got passed where the episode took a turn and made literally no sense, which then became the inconsistency with her powers, as well as her completely going out of character for a whole scene, to fit their plot and was completely unbelievable and VERY frustrating). I also agree 100% that the gangsters got WAY too much screen time. The whole temple plot (in my opinion) should've never happened. They wasted all that time introducing a new character when they could've better explained and delved into the ones they already had! The main characters!! They were funny at first, don't get me wrong, but towards the end I actually ended up skipping their parts to get to the main plot again. It started off so strong and I was in love with it! And in love with them! This couple is definitely one of my favorites! They were so funny and worked so well together, their chemistry was undeniable! But I just wish they would've developed the love triangle tension more like you said, and given those AMAZING /main/ characters more development and angsty backstory that make us cry! Amazing review though!! This is the first I've seen of your reviews but I liked it!! I'm glad I found someone else who felt the same as me! Don’t worry, your comment didn’t sound negative 🙂 We definitely seem to have similar feelings concerning this drama! I’m mostly baffled as to why so much time was wasted on all of the gangsters, high school kids, and monk stuff. Like you, I thought it was funny for a while, but then it just took over and got boring. And yes, the inconsistencies with her powers were super obvious. Do you know of any dramas with a similar couple? I loved the cute fluffiness in this drama and want more.